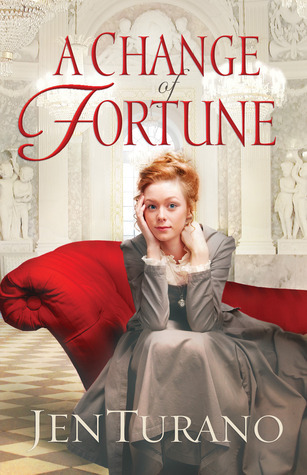 A Change of Fortune is a short and hilarious romance by Jen Turano. The story surrounds heiress/ governess Eliza and her mission to get her stolen inheritance back. Along the way, Eliza finds a new love and family with Hamilton Beckett. I really enjoyed this debut. Turano has created a story with engaging characters and incredibly entertaining dialogue. I will admit, when I read a story, I read it for action scenes. I love my books fast paced and full of action, not dialogue. This book was incredibly entertaining both in action and dialogue. This book was funny. I found myself chuckling out loud numerous times. Eliza is quite the character. She is privlidged and a lady of means, but she is also sarcastic and witty. The first few chapters of this book are incredibly funny. I found myself wishing that movie companies made historical romantic comedies- this would make a perfect movie! The characters were entertaining (loved Eliza- loved to hate Theodore!) and I found myself wanting more after the book was over! (Luckily the second book in the series comes out in June). All in all this was a quick and satisfying read. I would put this author in the same genre as Deanne Gist for how entertaining the story was. If you enjoy a good light hearted historical read- I highly reccommend this book. I eagerly wait for the second book in this series.